Page 1 of 2 - NVIDIA GeForce GTX 980M and GTX 970M: Mobile GPUs that unleash desktop class performancePage 2 of 2 - NVIDIA’s GeForce GTX 970M put to the test! Two weeks ago NVIDIA launched their most power efficient GPUs ever with the GeForce GTX 980 and GTX 970 utilizing the second generation Maxwell architecture in a fresh new GM204 chip. Hooray for desktop users, but what about notebook gamers? Historically, the equivalent high-end mobile GPU could only muster about 50% the performance of the desktop counterpart. 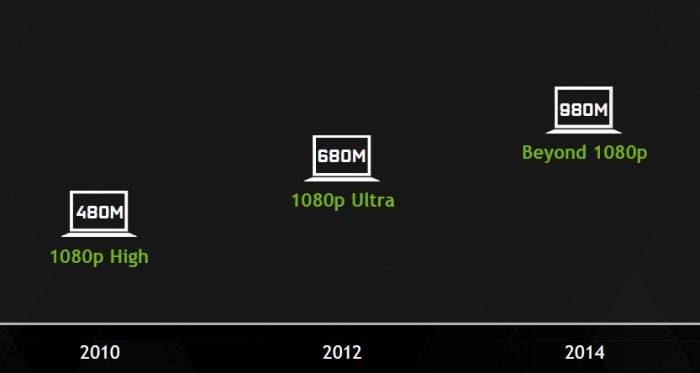 But what if we told you NVIDIA’s next generation mobile GPUs can actually deliver near desktop equivalent performance for notebook gamers? But wait, what if we also told you that you can also experience high performance gaming while not plugged into a power socket? But that they did, and we've test results to prove it too as we managed to test drive Aftershock's prototype S15 gaming notebook that's equipped with a GeForce GTX 970M GPU. 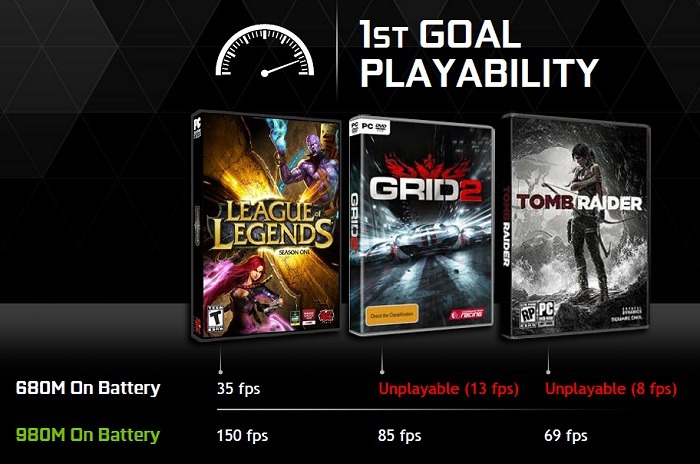 Before we share the performance results, let us dial back a bit to understand the design philosophy of the GeForce GTX 900M mobile GPU and how NVIDIA achieved what was previously thought as a holy grail for mobile gamers. What are the new mobile GPUs launched and their positioning? Today, NVIDIA is officially launching the GeForce GTX 980M and GTX 970M mobile GPUs. Similar to their desktop counterparts, they will immediately replace the GeForce GTX 880M and GTX 870M respectively. The rest of the mobile GPU models in the mid and lower tier will remain as they are currently. They are expected to narrow the performance gap between desktop and mobile GPU parts significantly and cater to gaming beyond 1080p resolution. While most leading notebooks are fitted with 1080p screens, there’s a small but growing segment of gaming notebooks that are equipped with 3K resolution screens. These notebooks typically come with a panel supporting 2,880 x 1,620 or 2,560 x 1,440 pixels resolution and make up about 7% (accurate as of press time) of all notebook models offered in the market. The new GeForce GTX 980M and GTX 970M aim to deliver good gaming experience even at these resolutions and a great one at 1080p. For your information, these GPUs aren't just a paper launch; laptops using them are ready and shipping now. To find out which notebooks are available with the new GPUs at the time of publishing this article, you can refer to our report here. 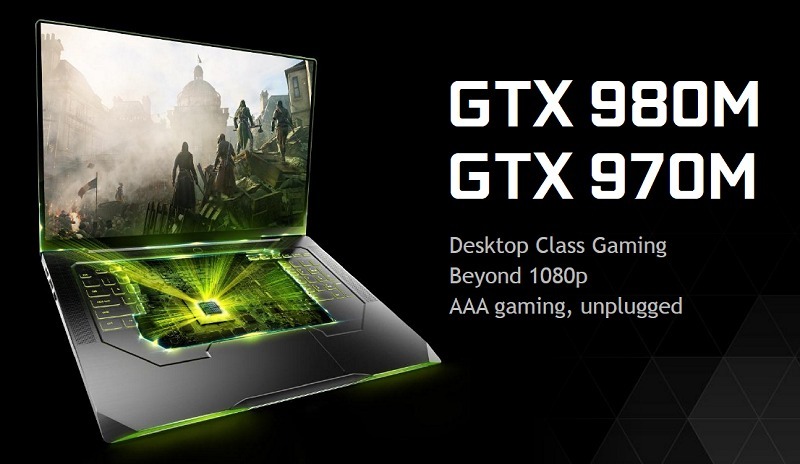 How different are the GeForce GTX 900M mobile GPUs from the desktop GeForce GTX 900 series? As far as capabilities and features are concerned, you'll find all the goodness of the GeForce GTX 900 for the desktops carried over to the mobile GPU parts as well. This means a GM204 chip with the second generation Maxwell graphics architecture which includes the Maxwell Streaming Multiprocessor (SMM), Dynamic Super Resolution (DSR), Multi-Pixel Programmable Sampling with Multi-Frame Sampled AA (MFAA), Voxel Global Illumination (VXGI), VR Direct and more. To fully read up on the details of the second generation Maxwell graphics architecture, you can refer to our GeForce GTX 980 revealed article. Additionally, it will come with support for other NVIDIA technologies that have been supported on the previous generation GPUs such as ShadowPlay, Twitch Broadcast integration, GameStream, Optimus, GeForce Experience and more. From the point of view of technical specs, the GeForce GTX 980M is endowed with 1536 operational CUDA cores, while the GTX 970M has 1280 CUDA cores. In terms of memory bandwidth, the GTX 980M still offers a 256-bit wide memory bus to interface with fast GDDR5 local memory, but the GTX 970M has less stream processors and thus a reduced memory interface width at 192 bits wide. 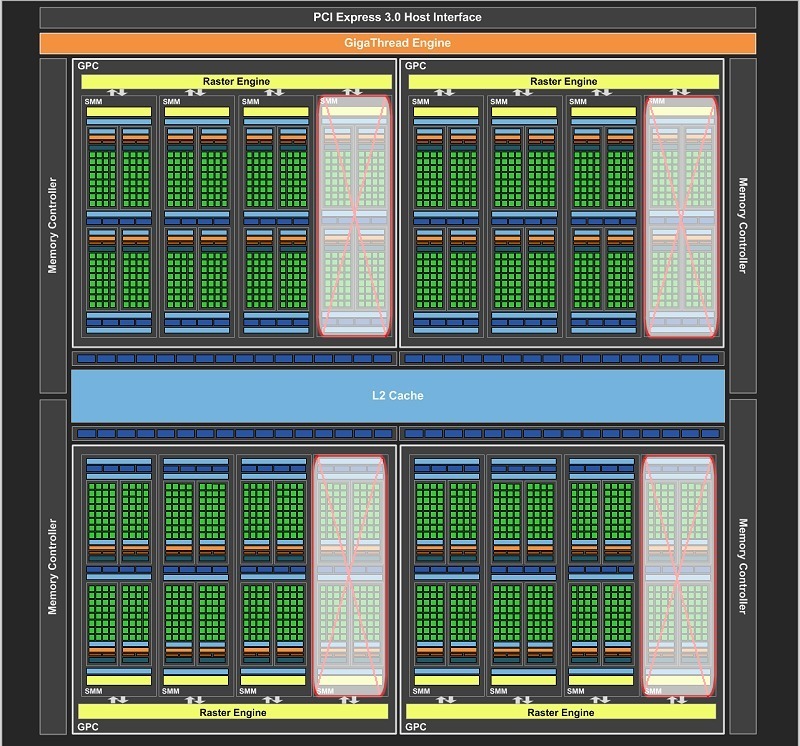 With a 128-CUDA core per SM layout, this corresponds to four graphics processing clusters (GPC) with 12 streaming multiprocessor (SM) units for the GTX 980M and three GPC clusters with 10 SM units for the GTX 970M GPUs. The desktop counterparts boast 16 and 13 SM units respectively (both with four 4 GPCs). 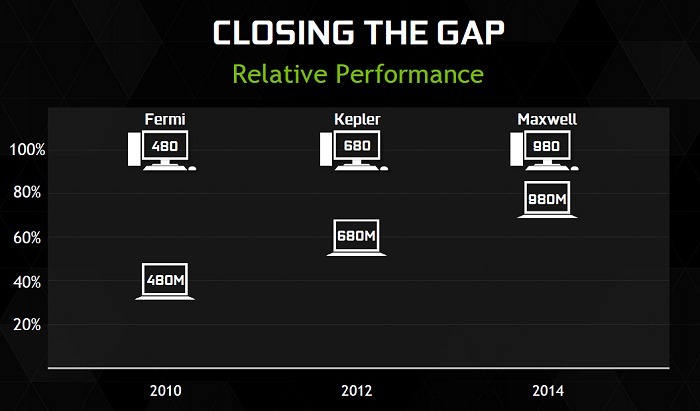 So technically speaking, NVIDIA kept their end of the bargain when they meant near desktop performance. We'll share more from actual results later in this article. While it seems like the GeForce GTX 980M can match the performance profile of a desktop GeForce GTX 970, the available memory bandwidth could be the limiting factor to their performance. Perhaps the improved memory compression algorithms and caching that was highlighted for the second generation Maxwell architecture can make up for some of the differences. Ultimately, you’ll want to see actual test results which we can sum up that you won’t be disappointed. Delivering desktop class performance - unplugged! One of the most annoying aspects of current gaming notebooks is their drastic performance drop when you unplug them from the wall socket. This often resulted in an unplayable gaming experience. The reason for this discrepancy is primarily down to power management. If you’ve ever plugged in a power meter to monitor the power draw from the wall socket, you’ll realize that a powerful gaming notebook can easily draw 200W or more. However, when it’s unplugged, the notebook has to rely on its own battery to drive the notebook and typically most can’t output a whole lot more than 100W of power. Worse yet, some of the sleeker machines might only be capable of up to 60W power output from their battery. The battery simply can’t provide the amount of power required to sustain a smooth level of gaming performance. That would mean something has got to give, such as running at lower frequencies for both the CPU and GPU, among other changes in key components so that the notebook’s battery can still power the system. Then there are vendors who want to preserve a notebook’s battery life on the move and thus limit GPU power drastically. To overcome this, NVIDIA has been aggressively working with notebook OEMs and ODMs, as well key battery suppliers to remove the conservative power caps to the GPU and supply more power. Such an initiative will ensure that you can truly enjoy gaming on the move, without being tethered to the wall outlet. 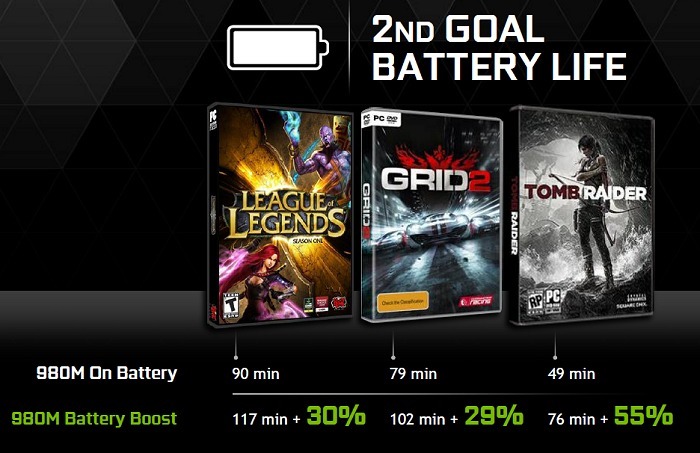 This is part of NVIDIA’s Battery Boost initiative that first debuted in the GeForce GTX 800M GPUs and it’s being improved to new heights in this edition as we’ll cover more of its battery power saving features that it incorporates. This does mean that there’s more effort required from all parties - NVIDIA, OEM vendor, battery supplier and more to ensure this experience pulls through. So while it’s easy just grab the latest and greatest GPU from NVIDIA for great performance, proper optimization all through the notebook is required to bring the best out of each machine. While there’s no logo certification program yet to help consumers easily figure out which machine has gone through proper optimization, NVIDIA will for now maintain a list on its website to help end-users. At publication time, the two notebooks that NVIDIA has made special mentions of having a good implementation of Battery Boost are the MSI GT72 and ASUS G751 gaming laptops. So we’ve seen earlier that an uncapped and more power efficient GPU along with an improved battery designed to output more power than deliver a pretty good gaming experience. However as we all know, once you’re past a certain threshold of 30 FPS or higher (game dependent), we tend not to really notice the added FPS advantage. You’ve two ways to deal with this:- trade the added performance for an even higher quality in-game setting, or trade excess FPS for a battery life boost. Certain enthusiasts might want to tinker with the first option, but by and large, most laptop gamers wouldn’t mind more battery life to prolong their gameplay. To minimize the technicalities in managing this, a Battery Boost equipped notebook with the latest GeForce Experience software allows the user to set an FPS target, which starts from 30 FPS by default as this is the minimum figure that provides a decent gameplay for many games. With this setting in place, the excess performance budget of the GPU is traded for power savings. You can however fine tune this to a higher rate to suit your gaming preferences as each game responds differently with different lows and highs. 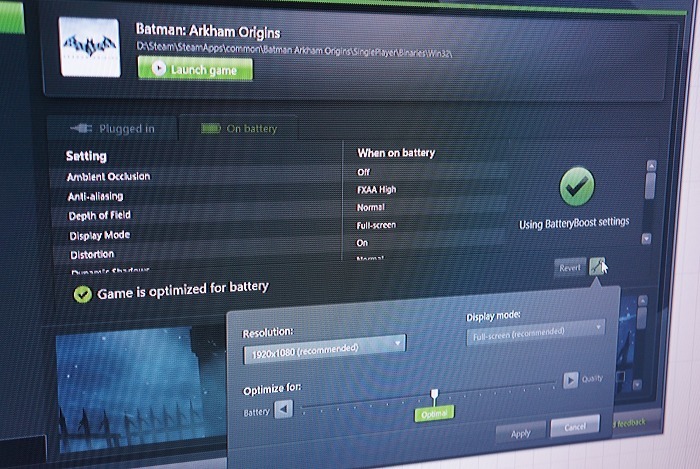 What’s really new this time for Battery Boost on the GeForce 900M series is a new “On Battery Setting” that allows you to set graphics quality settings that apply only while the notebook is running on battery. The ability to set a different graphical setting while running on battery allows you to crank out even more battery life (or performance without using the FPS target function) out of the notebook. So that means you’ve another profile to fire up while the notebook is plugged into the wall socket. What's more, you don't even have to manually toggle this as GeForce Experience is clever enough to know whether you are plugged in or running on battery and will immediately adopt the respective profiles that you've pre-configured. Call it Battery Boost 2.0 if you will, the combination of targeted FPS settings along with an optimized graphical settings profile per game on battery allows you to reap the full benefits of gaming on the go in an efficient manner. Your mileage from Battery Boost will vary from one notebook to another (which depends on the optimization done at the hardware level and the battery type), and it may also vary from game to game, which are dependent on graphical settings used. 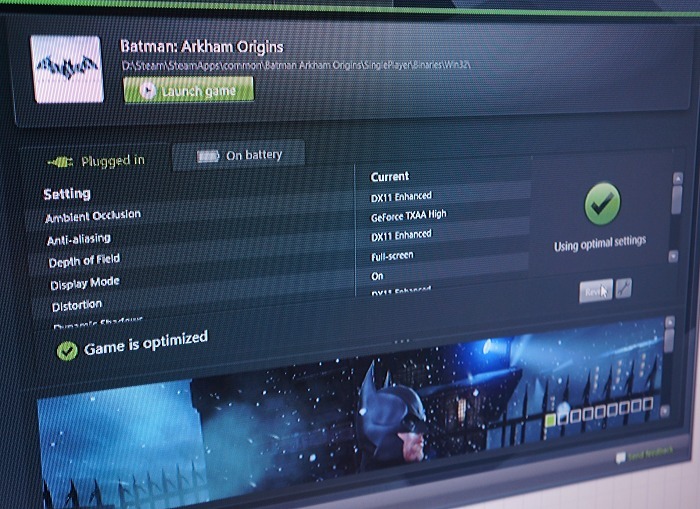 If you intend to go the easy route and stick to Optimized recommended settings by NVIDIA, take note that it’s a work-in-progress as it takes time for NVIDIA’s Lab to test games on various notebook hardware, more over for a new GPU series like the GeForce 900M where notebooks are just about being made available in retail. 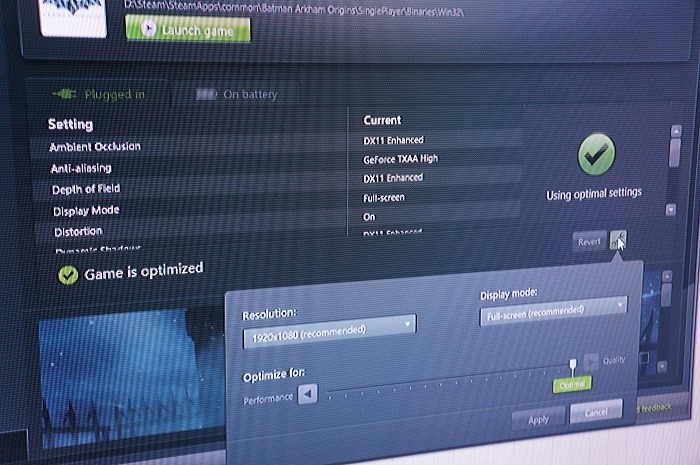 But given some time, the GeForce Experience software will do what it achieved for desktop gamers on notebooks too. Last but not least, NVIDIA has clarified that Battery Boost will not work in conjunction with notebooks boasting dual GPUs in SLI as such a setup would draw way too much power for Battery Boost to make an effective impact even when enabled. Now, it's time to check out the preliminary results of an actual prototype notebook using the new GeForce GTX 970M GPU, so head over to the second page!